Ever gone hunting and asked yourself, How Fast Can A Deer Run? You are just about finding out just how fast it goes. There are several species of deer, the white-tailed deer and mule deer being the most common types. Are you fascinated about hunting? Do you love taking up challenges? Then the deer might just be your favorite animal. It does not only produce a very tasty venison but is quite challenging to hunt down when they are running and also make hunting experience altogether fun. So, Just How Fast Can A Deer Run? Is It Possible To Outrun A Deer? The speed level of a deer mostly depends on the situation it finds itself in. It also depends on their speed to survive from their predators and hunters who hunt them. Since speed is very essential for them to escape dangers they are faced with, they run very fast. Some say like the speed of light. They, however, are not able to maintain this speed for a long period of time. You could ask, what distance are they able to cover? Studies have shown that the deer can cover a distance of about 30 miles in an hour. Some people also believe that it actually covers more even though it doesn’t keep the pace for a long period. Deer run in zigzag motions and with fidgeting impulses as a way to sense and avoid their predators from attacking them. They are also great jumpers believed to jump a height of about seven feet when standing and can go as high as ten feet when running. A deer has the ability to bound very well since it can cover a distance of about 30 feet in one leap. The deer is not just an excellent runner but it is also a good swimmer and can swim across waters when under any attack. When under attack, it runs and lure its predator into a trail with lots of obstacles. This, it does, so as to slow it down. Size and body frame are great contributors to the speed of a deer. They have an average weight of about 80 kg and a length of about 1.9 meters. Speed is of utmost importance to these animals as they rely on it to outrun their predators and depend on it for survival in the woods. This tells us that the deer might not be the easiest animal to hunt or prey on. Like I said, hunting a deer can be challenging yet also fun. You might wonder if there is any possibility of outrunning a deer. It is not impossible to outrun a deer but you should be able to maintain a speed of about 7-10 miles per hour for about 3-4 hours to stand a chance of outrunning a deer. Since there is a great difference between the speed of humans and that of the deer, we are likely not going to outrun him. It is wiser to get familiar with its habitat and escape routes. That way, you stand a better chance with it and even if it escapes, you are almost sure to come across it again. Since you now know about how fast a deer can run and the distance it is able to cover, you might ask yourself, how can I hunt this animal?” Nobody likes to go hunting and come back home disappointed. This is why it is important to know what to do even before you set out for hunting. As you know, preparation is very essential. Research has shown that the human smell comprises a complex mix of the compound on our bodies and skin. Also, research shows that a deer can sense smell from half a mile. Researchers have shown that whitetail species boast thousands of sensitive-receptors in their nostrils. They can use these to sort identify up to 6 smells at one time. Having this in mind, it is advisable to stay as scentless as possible. Some scent eliminating sprays are also available to help eliminate any form of smell around you. Studies have shown that a deer does not hear any better than humans do. They hear what we hear. However, they are able to detect ultra-high frequency sounds which we cannot detect. Their ears resemble tiny satellite dishes, tipping back & forth and rolling around so as to pick up, as well as sort out and then lock onto various sounds that they hear. The two sure ways to defeat the deer’s ear is either to be silent or to be loud. Their ears are not so hard to beat and with common sense, you can beat it. Scientist says that a deer has a vision range between 250 and 270 degrees. This helps them visualize movement below the horizon. They are not very good at picking up the movement above the horizon. This gives you a chance of getting away with more movements on trees than on the ground. Using the best camos is one way to defeat their eyesight. It serves as a very good concealment. Natural and warm colors allow you to blend in and being noticed are the best. You need to practice and know the best position you can take to aim rightly. You can lie, sit or kneel. Practice knowing which works best for you. Make sure you use rifles that can aim and give accurate shots. It is best to aim at the deer’s back of the head. This way, the shot will land around its neck area. Avoid broadside shooting. Walking through the woods could alert the deer, so you should take quick steps for about 15 yards, stop and then go again. While doing this, try to keep your steps as light as possible. This reduces the alertness of the deer. In conclusion, I’m sure we have been able to answer the question of how fast a deer can run. Indeed, you have seen just how an excellent runner the deer is giving also its characteristics. 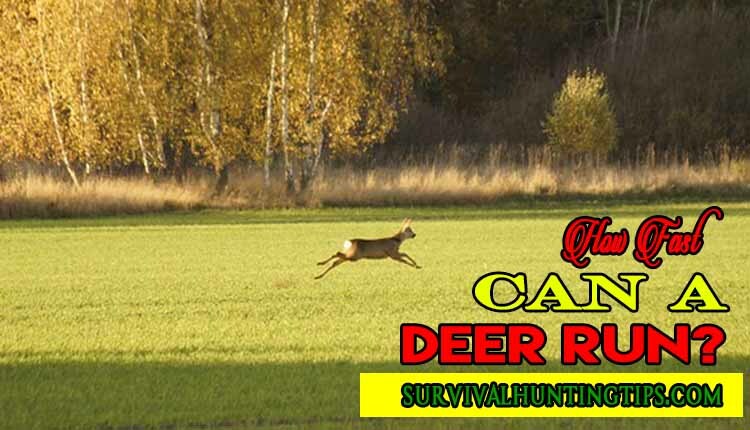 We have also seen some tips that are helpful in hunting a deer. I believe this has added to your knowledge about deer and you’ve found the information useful in improving your hunting expedition.